Tourist come to Santa Clara to visit museum of Che Guevara and to experience unique Cuban culture. 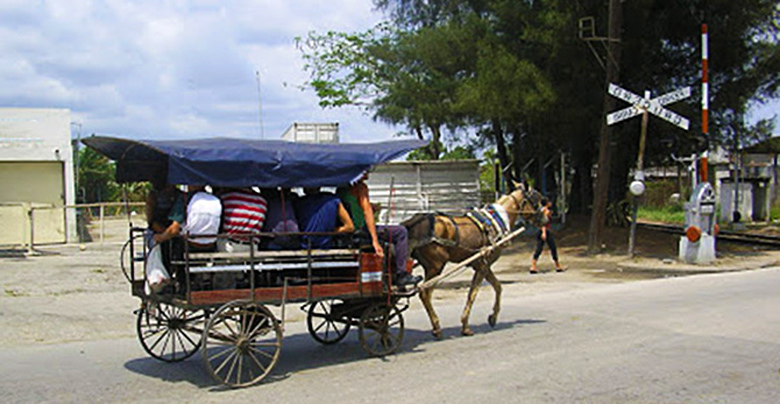 Santa Clara is located 274 km / 170 miles east of Havana. City has beautiful central park named after a Colonel Leoncio Vidal, who died in a battle in this square 1896. The museum of Decorative Colonial Art offers collection of Colonial decorative art and furnitures, Art Gallery is located in Parque Vidal. Leoncio Vidal charming square is the most popular park and heart of the city. It has pristine flower beds, wrought-iron benches, and period street lamps. These lovely touches have helped it retain its original vibe, the city has mostly colonial style architecture with narrow streets, there is also fountain Nino de la Bota. JetBlue Airways re-establishing regular air service to Cuba, offers daily flights to Santa Clara from New York JFK, Orlando and Fort Lauderdale, Florida. The American Airlines offers scheduled services from Miami, Florida to Santa Clara and Havana. WiFi Spots: Parque Vidal and Boulevard near the Café Europa in city centre, as well Sandino park and Los Framboyanes square. Exuberarte is summer fashion event held in Santa Clara in the city main square, leading and the most talented Cuban fashion designers are participating in this fashion event. Fashion shows are taking place in city centre Leoncio Vidal park. The main objectives of Exuberarte is to recognize the professionalism and achievements of the textile initiatives in province ofVilla Clara and the exchanges between artists and the market, entrance is free to the public. It is time to ban horses as public transportation in city of Santa Clara. Hotel Central landmark hotel in Sanata Clara is overlooking the main square Parque Vidal, the hotel is being restored to its glory. 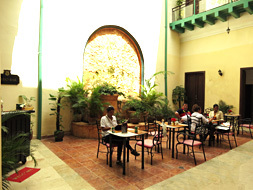 Elegant and atmospheric restaurant with patio bar in open-air interior courtyard of the old colonial home. 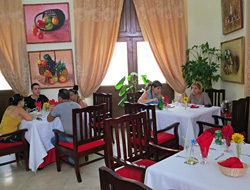 The food is affordable, speciality: Pizza al la Gobernador, Criolla and Cuban cuisine, at evenings there's a live music. Address: Calle Independencia Boulevard and Bruno Zayas city center. Museo de las Artes Decorativas dating back to 1810, found in colonial mansions, located in the ancestral home of the Carta family, is one of the most attractive building in Sanata Clara, facing Leoncio Vidal central park. The exposition include furniture collections of 18th and the 19th centuries, the furnishings and paintings which belonged to the local affluent families. Particularly interesting are the objects donated by the Cuban poetess Dulce María Loynaz, items are influenced by the Neoclassical, Rococo and Imperial Cuban styles. Modern hotel in city centre, offer pool bar, restaurant, comfortable rooms and an outdoor swimming pool. All rooms are equipped with a closet, private bathroom with a bath. Each room is air conditioned and has flat-screen satellite TV. Located among Coco palms 5 km from the city, with cozy tranquil atmosphere and direct contact with nature. Two storey bungalows, scattered among beautiful vegetation, has large swimming pool. Each room is air conditioned and satellite TV. Surrounded by eucalyptus trees, quiet hotel imitate houses before Columbus. Offer all comfort and services: massage, acupressure, fangotherapy, swimming pool and night fashion show. Each room is air conditioned and satellite TV. Hotel facing the Leoncio Vidal Park city centre, flanked by La Caridad theater. When the night falls, top roof Bar and Disco-club invite all guests, at the basement is stylish Spanish style pizza restaurant, best pizza in Santa Clara. Each room is air conditioned and has flat-screen satellite TV. 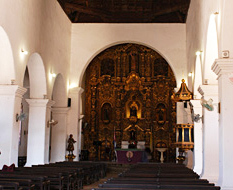 Santa Clara was founded on July 1689, large families, a priest and a governor came from the coastal city of San Juan de los Remedios. The population of Remedios was torn between the option of leaving their city, constantly besieged by pirate attacks, they arrive to the hill where they rejoined the other two existing families. A mass was given under a Tamarind tree and the city was born. Since then, the place under the tree is known as Loma Del Carmen, Carmens Hill. A second generation church exists in a beautiful park along the place with a monument commemorating the event surrounded by a fourth generation Tamarind tree. At its beginnings, the settlement was called Cayo Nuevo, then Dos Cayos, Villa Nueva de Santa Clara, Pueblo Nuevo de Anton Diaz, Villa Clara and finally Santa Clara. Construction of the city began not far from Carmens Hill. Following the Spanish standards, a perfect squared layout with a central plaza Plaza Mayor today Parque Vidal. The first buildings erected were the Cabildo City Council and a modest palms tree church. This building was enhanced in 1725 to a brick one, and stayed the center of the Parque Vidal until August of 1923 when it was torn down to expand the plaza and build a new church. The position of Santa Clara city made it a great communication link, east-west and north-south. By the 19th century, Santa Clara was bigger and more populated than the rest of the towns around, including what was once Remedios. As a necessary stop between Havana and the east of Cuba, the city gained the title of Las Villas province capital. 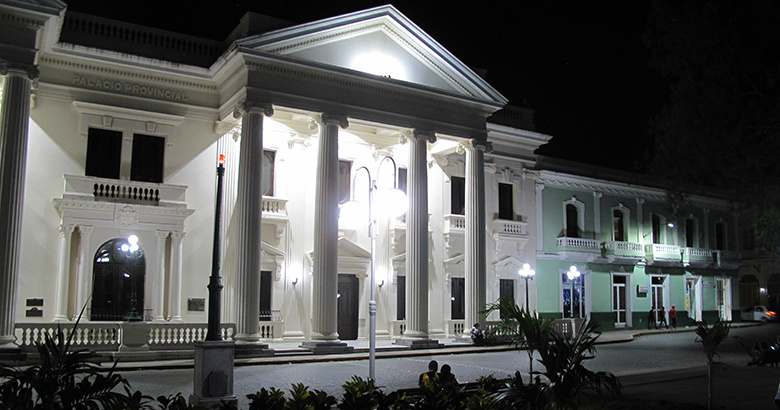 The one of the seven theaters from the Colonial era in Cuba Teatro de la Caridad, unique Charity Theatre is housed in an 18th century mansion which belonged to the Sanchez Iznaga family. Constructed in various types of architecture and illustrates by the techniques used during the Colonial period. The theatre has beautiful porch with slim columns, a fashioned iron balustrade and wooden beams. Teatro de la Caridad has a great collection of instruments and accessories of the Colonial time. 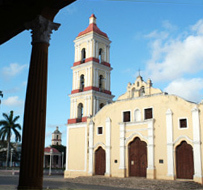 San Juan de los Remedios 500 years of history - originally called Santa Cruz de la Sabana, It is recognized as the eighth oldest city in Cuba, located 20km north of Santa Clara. It was declared a city by Isabel the Second, Queen of Spain, when the Cuba was still a colony. The main attraction in the Plaza Isabel II is the Iglesia Mayor, Church of San Juan Bautista containing beautifully decorated gold altars. The city was under constant siege by pirates, famous El Olones corsair. Therefore the gold was hidden under white paint. In a renovation that took place in 1944, thanks to the generous Cuban millionaire Eutimio Falla Bonet, the real gold under the paint were re discovered. Remedios is distinguished for its Christmas festival, Las Parrandas de Remedios, one of the most popular events of the region that takes place every year from 16th to the 26th of December, is considered the oldest festival in Cuba. 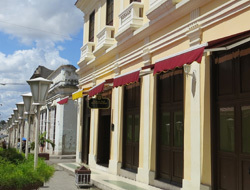 Boutique hotel at privileged location in Remedios town center, few steps from the oldest church in Cuba. Known for the Christmas festival Las Parrandas de Remedios. Standard room average rate, breakfast included, per person, double room occupancy and a flat-screen satellite TV. Colonial architectural style, combines modernity with colonial environment, a small hotel in an old 18th century colonial house. Has high ceilings, long windows balconies that overlook main square. Cayos, ideal setting for perfect island vacation, It is located at the north of Santa Clara, linked to the mainland via a 48km causeway. 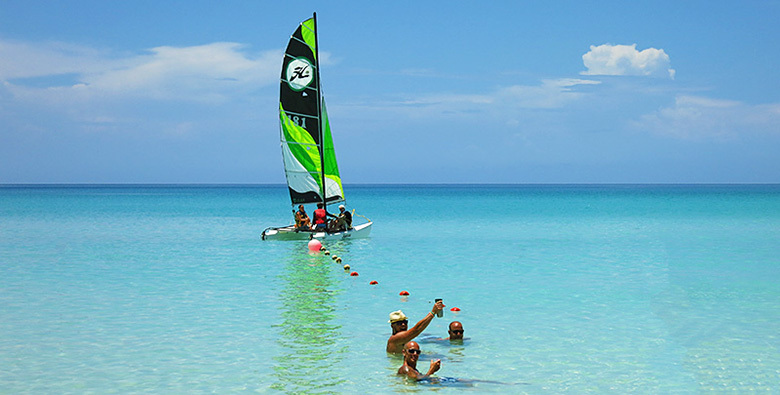 Cubas newest resort area With only few all-inclusive resorts and no towns, it remains secluded a perfect spot for beach relaxing holidays. Cayo Santa Maria pristine reefs contain unspoiled corals and schools of colourful fish. With more than 50 km of spectacular beaches, soft white sand with palm trees and mangroves and nearly 200 species of birds such as: herons, ibis, pelicans, cormorants and oystercatchers. UNESCO has declared the region a Biosphere Reserve, it's now a great destination for ecotourism, to get a bit closer to nature. Ecological trails are available for hiking, guided jungle tours give visitors a close look at plants, flowers, trees and waterfalls. Jeep safari adventures, and the catamaran journeys that boast magnificent views. The waters surrounding the island are a delight for deep sea fishing, scuba diving snorkelling, or Sea-Do riding. 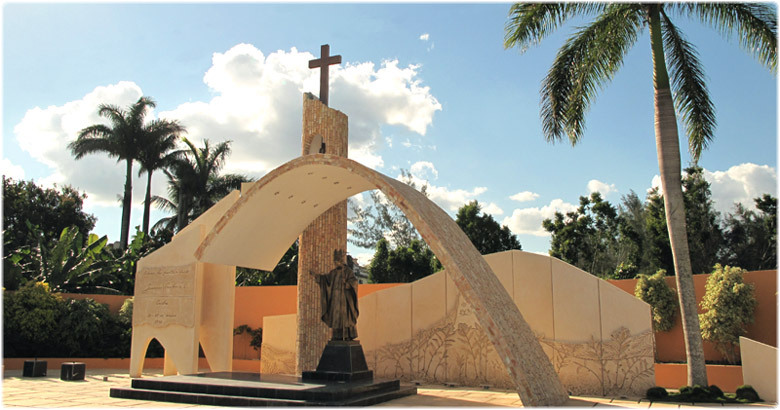 Memorial of Pope John Paul II, honour his historic visit in Santa Clara in 1998. 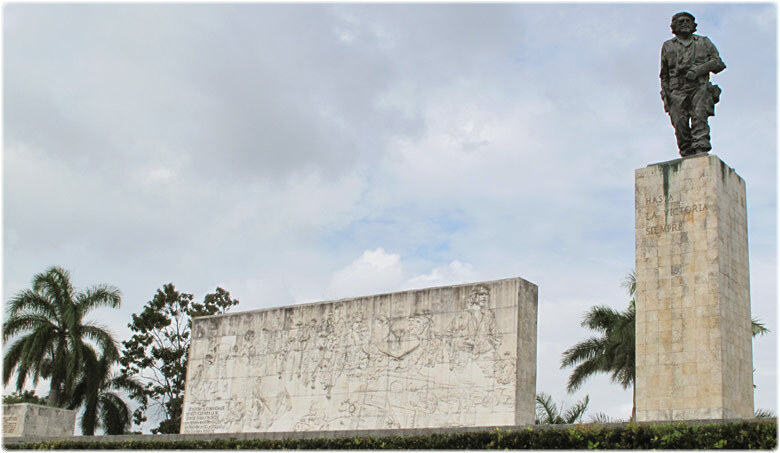 Monument of Ernesto Che Guevara and the museum, outlook his live in Cuba. Museum of Decorative Arts with impressive collection of Colonial decoratives. Art Gallery in Leoncio Vidal park, displays art work of modern Cuban artists. The last battle of the revolution Che Guevara use bulldogger to stop the train. 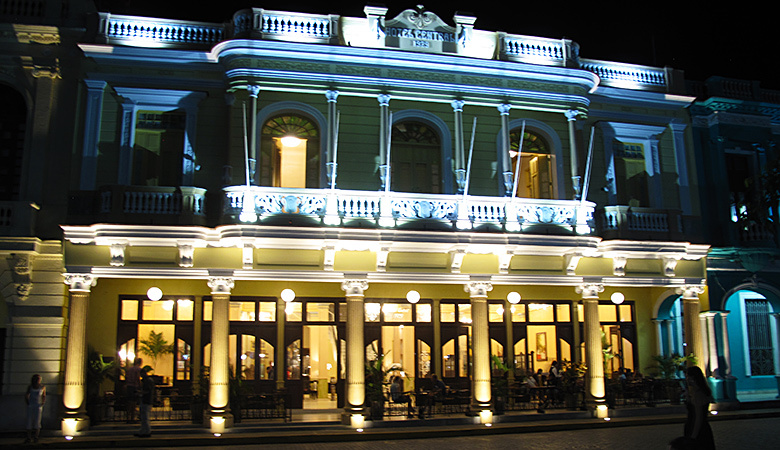 La Caridad Theater, is one of the seven big theaters from the colonial era. Parque Leoncio Vidal, park in city center neo classic and colonial buildings. 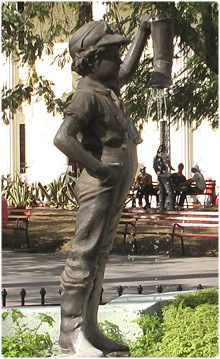 Statue of Boy with the leaking boot, statue of Marta Abreu in Vidal park. Parque Tudury known as Parque del Carmen neo classical Iglesia de Carmen. Under the monument is a museum of Che Guevara Museo Historico de la Revolucion, with good displays about Che life in Cuba. Every year more than 250 000 Cubans and foreigners visit the Ernesto Guevara sculptural complex, the remains of Che and his comrades who fell in Bolivia have been interred at this site, the Mausoleum is open to the public.